The women’s team had a historic weekend, going 1-1 and upsetting sixth-ranked Middlebury 1-0 on Saturday afternoon. This victory pushed their record to 6-12-1 and 3-8-1 in conference. For the Cards, the win was the first against Middlebury in program history, pushing their all-time head-to-head record to 1-58-4. Sarah Goss ’19 scored the lone goal in the second period for the Cards, and Allegra Grant ’20 made 38 saves in the shutout victory. Captain Grace Keogh ’19 was happy with the way the team played in the victory. “The combination of playing as a composed unit, picking up our communication, and Allegra Grant’s phenomenal game in net helped us to get Saturday’s crucial win,” Keogh said. Keogh said that Friday’s close loss also made the team believe in themselves and that they could pull the upset. Next up, the Cards have a crucial home and home on Saturday and Sunday against Trinity, where they look to keep the energy and effort from their win going. For the second time in three years and just the third time in the last 32 years, men’s hockey has won the Little Three Championship. The Cards clinched the title by defeating Williams in OT, 2-1, after being down 1-0 in the final minutes of the third. This win, combined with a 2-0 victory over Middlebury the night before, pushed the Cards’ record to 14-4-2 overall and 12-0-2 in conference play. In the thrilling win over Williams, Walker Harris ’20 scored the tying goal in the third period with just over a minute to go. Andy Espinoza ’19 achieved a similar stunning feat, scoring with 10 seconds left in overtime to take the Cards to victory. Tim Sestak ’20 earned his second straight NESCAC Player of the Week award for his defensive efforts. He made a great 33 saves for the team, which were key in keeping the score at 1-0 until the Red and Black tied it up late in the third. The team performed fabulously in OT to win even though they could have ended with a tie. Malinowski added that winning the Little Three in two of the last three years truly shows the team’s progress. 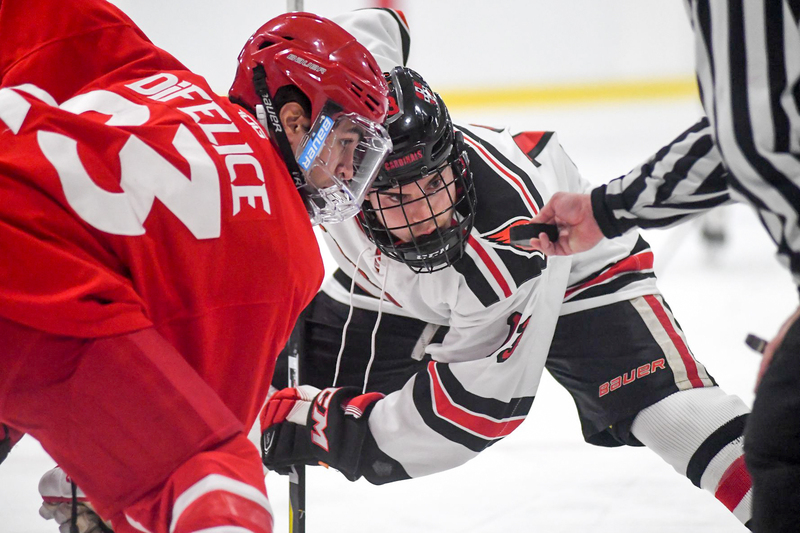 Next up, The Cards take on Bowdoin and Colby at home on Friday and Saturday afternoon, respectively. Malinowski says it is important for the team to remain focused on the task at hand during these last few home games. 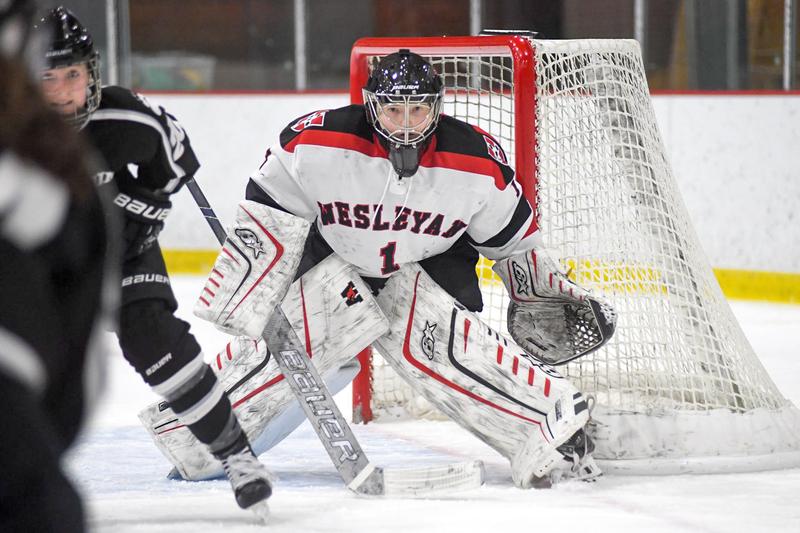 Malinowski is looking ahead to more ’CAC competition, especially games to come on the Wesleyan ice. Men’s hockey will play at home this Friday, Feb. 8 at 7 p.m. in a special “Hockey Fights Cancer” game. The team will honor Connor Albert, a member of the squad through Team IMPACT who passed away last year. Their final home game takes place less than 12 hours later on Saturday at 3 p.m. The Red and Black will honor their seniors in a competitive matchup against Colby.